Ivory Coast President Laurent Gbagbo should stay in power for up to a year beyond his official mandate, the African Union (AU) has decided. Elections were due to be held in the country this month, but were shelved when Mr Gbagbo invoked a law which he said allowed him to stay in office. The AU said he should appoint a prime minister for the next year acceptable to all, to assume executive powers. South Africa remains the AU's mediator but as part of a five-person committee. The Ivorian opposition has accused South Africa of bias in favour of the president. 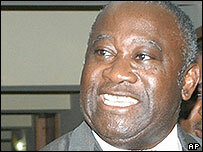 The New Forces rebels running the north of the country had previously demanded that Mr Gbagbo stand down. The president boycotted Thursday's summit of the AU's Security Council in Ethiopia and last week refused to attend a West Africa summit, saying his neighbours wanted to interfere. The BBC's James Copnall in Abidjan says it remains to be seen whether the opposition, and in particular the New Forces, will recognise President Gbagbo's authority. The leaders of South Africa, Nigeria, Ethiopia and Sudan were among those attending the extraordinary meeting in Addis Ababa, which was called when it became clear that the 31 October elections were not going to happen. They "reiterated the importance of organising elections on the appropriate date," but said in the mean time a premier should be appointed with "full authority over members of the government". With a new prime minister in full control of the cabinet, it hints at a reduced role for President Gbagbo, our correspondent says. South Africa will continue as AU mediators, but the day-to-day mediation will be carried out by a five-person committee chaired by the South African envoy. Our correspondent says this effectively dilutes the South Africans' influence and the opposition will see more chance of success in peace negotiations with the South Africans no longer so prominent. The Ivorian crisis began three years ago when the New Forces seized the north of the country. The rebels are still in control there, while militias that support President Gbagbo roam the south. Neither the rebels not the pro-Gbagbo militias have disarmed as planned. The 10,000 French and United Nations troops who keep the two sides apart say they are short of resources for the task.